I did not update this blog for a very long time, was feeling lazy and uninspired. Today recipe is a moreish spicy beef with cumin. 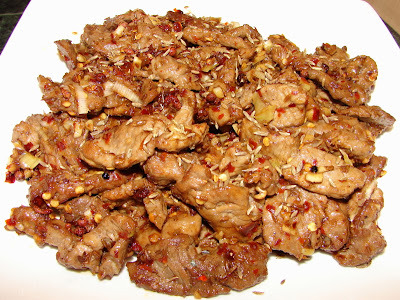 Cumin beef originates from the Muslim populated North-West of China. This dish is popular in many parts of China like Sichuan and Hunan, over here in UK I believe this has become very popular in many Sichuanese restaurants and home cooking introduced by Fuchsia Dunlop. Here is my version if you like to give it a try. This spice packed beef is simple to cook. I twice fried the beef in oil, the beef is tender with a caramelised flavour. It's a bit oily but you will not be disappointed with the flavour and texture of beef. Cut beef (against the grain) into thin slices. Mix with light soy, few drops of dark soy, egg white, cornflour and cooking wine. Leave to marinate for 1 hour or overnight in the fridge if you like to prepare in advance. Crush the cumin seeds to release the aroma. Chop the spring onion, ginger and garlic. Cut onion into small pieces. Rinse or wet the Sichuan peppercorns this is to avoid getting them burnt too quickly. When you are ready to cook. Heat oil in wok till smoking. Slowly tip the beef into the hot oil. The oil will boil rapidly, be careful. Stir the beef to ensure the pieces do not stick together. Highest heat and fry beef till all pieces are no longer pink about 1 - 1.5 min. Remove the beef onto a large metal sieve to drain. Lower heat to medium and continue heating the frying oil, this oil will bubble rapidly and may splatter because of the moisture from the beef. Keep stirring the oil slowly till bubbles subside and the oil becomes very hot again. Wait till the oil is smoking, add drained beef into hot oil again. Highest heat again, stir and fry the beef for 2 - 3 minutes this time till beef has caramelised around the edges. Remove beef and drain on the same large metal sieve. Why frying the beef twice you may ask. This is to ensure the beef will caramelise quicker without letting the beef turning tough. If the beef is fried once till caramelised this will take much longer and by that time the beef will shrink more and becoming tough. Remove the oil for other use and clean the wok. Add some oil to the clean wok heat till medium hot. Add Sichuan peppercorns, stir till fragrant. Add chilli flakes and most of the cumin seeds (leave about 1/2 tsp to sprinkle on the beef before serving). Stir till fragrant. Add chopped spring onion, garlic and ginger. Add onion stir till slightly soften. Add chopped fresh chilli if using. Add beef, pinch of chicken bouillon powder and enough light soy or oyster sauce to taste. Stir and have a taste if you like more spicy add some chilli oil. Plate up and sprinkle with remaining crushed cumin seeds on top. Pleased you're back! I've been meaning to make this for ages, but never got round to it; you've put the idea back in my head. I like the idea of deep-frying the beef twice — will try it that way next time. Yay, you're back! I made a very similar dish but with lamb and some Turkish green peppers. Was really tasty.